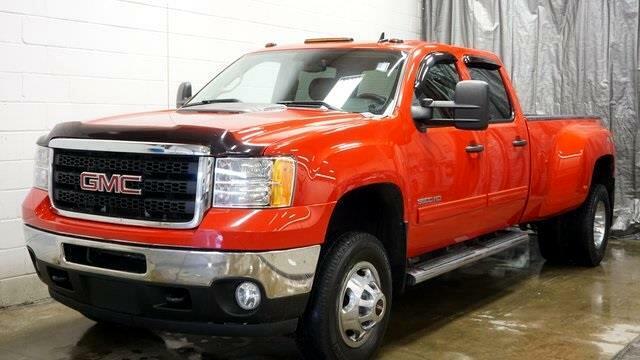 2011 GMC Sierra 3500HD SLE 4X4 DIESEL 4D Crew Cab, Duramax 6.6L V8 Turbodiesel, Allison 1000 6-Speed Automatic, 4WD, Ebony w/Leather-Appointed Seat Trim, 4-Wheel Disc Brakes, ABS brakes, Air Conditioning, Alloy wheels, AM/FM Stereo w/MP3 Compatible CD Player, Auto-Dimming Inside Rear-View Mirror, Body-Colored Bodyside Moldings, Bumpers: chrome, Compass, Delay-off headlights, Driver & Front Passenger Sliding Visors, Driver door bin, Driver vanity mirror, Dual front impact airbags, Dual-Zone Automatic Climate Control, Electronic Cruise Control w/Set & Resume Speed, Electronic Shift Transfer Case, Emergency communication system, Front Center Armrest w/Storage, Front reading lights, Front wheel independent suspension, Fully automatic headlights, Heavy-Duty Handling/Trailering Suspension Package, Illuminated entry, Leather-Wrapped Steering Wheel, Outside temperature display, Panic alarm, Passenger door bin, Passenger vanity mirror, Power Door Locks, Power door mirrors, Power steering, Power windows, Rear reading lights, Rear seat center armrest, Rear step bumper, Rear-Window Electric Defogger, Remote Keyless Entry, Security system, Solar-Ray Deep-Tinted Glass, Split folding rear seat, Tachometer, Tilt steering wheel, Variably intermittent wipers. Priced below KBB Fair Purchase Price! Specializing in all makes models of trucks both diesel and gas. We have vehicles that no body else does. Please call us directly at (330)765-1200.